Minister of Justice and Correctional Services, Advocate Michael Masutha is set to brief the media on “Bosasa contracts and other irregular contracts within the Justice and Correctional services portfolio” on Monday. This follows the bad publicity that rocked the State Capture Commission of Inquiry involving its links with Bosasa through its subsidiary, GTS. It has emerged that Bosasa’s subsidiary company was contracted to by the Department of Justice and Constitutional Development and has been providing security services the Commission. According to an article published by the City Press in 2018, procurement procedures were also not followed in awarding the contract. It was on the back of that article that Chairperson of the Commission, Deputy Chief Justice Zondo took a decision to probe the allegations, while GTS was during that time stopped from providing services pending the outcomes of the investigations. According to the statement released by the Acting Secretary of the Commission, Peter Pedlar, the investigation into the matter did establish the link between GTS and Bosasa. 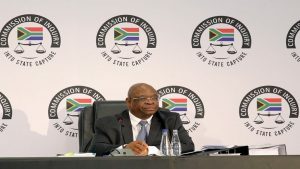 “The Chairperson of the Commission made the position of the Commission clear that, in the light of GTS’s connection to Bosasa and the fact that over many years there had been continuing allegations of corruption against Bosasa, GTS should not have been appointed or contracted or brought in to provide services to the Commission while those allegations remained unresolved,” reads the statement in part. The post Masutha to brief the media following bad publicity that rocked Zondo Commission appeared first on SABC News – Breaking news, special reports, world, business, sport coverage of all South African current events. Africa's news leader..